The Home - School Connection - I Love ABA! They can be quite an experience. 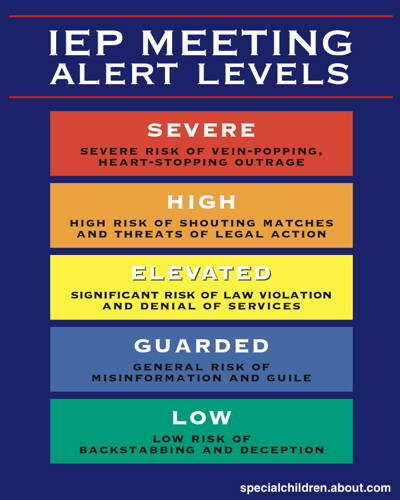 In the years I have been working as a Behavior Specialist, I have seen firsthand how emotional the implications of IEP Meetings can be to families. 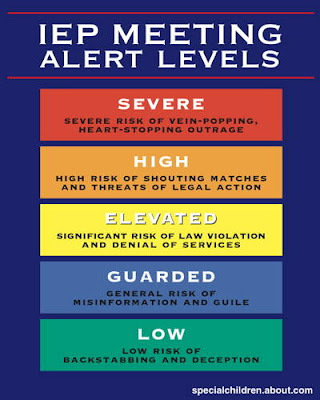 I have spoken with parents right after an IEP meeting who ran the emotional gamut from frustrated and angry, to scared and concerned, to depressed and tearful. I have met and worked cooperatively with some amazing educators who inspire and encourage me, and I have also encountered and dealt with educators who are very anti-ABA, incredibly resistant, or even combative. Families often deal with a new teacher, or set of teachers, every academic year. This can be a tiring and exhausting process. Just when you adjust to and get close to your child's teacher, the school year ends and its time for a new teacher, new classroom, and new personality. I'm sure most people would agree that a great, well trained, and passionate teacher can be the best thing to happen to any child. Some families absolutely LOVE their child's teacher, and other families despise the teacher. The Home-School Connection basically means keeping lines of communication open between the parents, home therapists, school, teachers, and other related therapists. The more everyone knows the child's goals, strengths, and weaknesses, the better for all involved. The home therapist needs to know how the child does at school, and the teacher needs to know what the child is working on at home. Research shows that when a family communicates regularly with the school and teachers about the home ABA program, and when that school includes the family in all aspects of the child's educational planning, the child does better with skill acquisition, skill generalization, and maintenance of learned skills (“The Home/School Collaborative Model.” Children & Schools, Volume 30, Number 3, July 2008). For all therapists, it is important to help the family you work for understand how to communicate with the school, and be sure to incorporate school skills and goals into your ABA sessions as much as you can to help the child generalize. For all parents, it is important to view your child's teacher (or teachers) as an important member of your child's therapeutic team. I see so many families who have estranged or tense relationships with their child's school and/or teacher. It is unfortunate when that happens, but if you are a parent in that situation hopefully this information will be helpful to you. Below are some general tips for therapists or for parents, to keep the Home-School Connection strong, which will ultimately benefit what we all care the most about: the children. Think Positive, Speak Positive- If you can re-frame the way you think about your child's school and their teacher, it will impact the way you speak to educators and administrators at the school. Try and focus on what you do like about the school, the good things you see in the classroom, positive qualities in the teacher, etc. When you speak to people at the school, begin any conversation in a pleasant tone and manner. Have a smile on your face when you speak to the teacher, always greet any extra staff in the classroom (such as paraprofessionals), and be sure to verbally recognize any small steps the teacher makes towards progress or improvement. Many parents and teachers get stuck in negative/ defensive communication patterns. The teacher sees the parent walk into their room and becomes instantly stressed and on guard. The parent sees that the teacher sent a note home, and automatically feels fear and annoyance. Break that negative pattern. The current method of communication and problem solving is not effective, that is why arguments keep occurring. If something isn't effective, why keep doing it? Change your approach, change your thinking, and change your actions. Keep Lines of Communication Open- How does your child's teacher keep ongoing communication with you, and how do you communicate with them? Weekly conferences? Monthly meetings? Daily notes that are sent home? Or do you only hear about your child's progress (or lack of progress) via report cards, and planning/ IEP meetings a few times a year? That is simply not enough communication. These children can change so quickly in terms of motivation, attention, and focus from week to week that their school performance may have incredible variability. You need to consult with your child's teacher and decide together what your method of communication will be. Most families I work with use a notebook or binder in which the teacher writes brief daily notes about the child's behavior, attention, and school performance. This is a quick and simple way for the parents and home therapists to know how the child is doing at school. If the teacher declines your suggestion to incorporate daily notes, don't give up. Be persistent. Make other suggestions, offer to brainstorm with him/her, and stress the importance of this issue. Teachers have many duties, and larger and larger classrooms, and sometimes they don't have the time to write daily notes. Maybe weekly notes would be better. Or maybe a quick email sent after lunchtime. Help the teacher create a system of communication, and include the home therapists in the exchange of information as well. Reinforcement Isn't Just for Kids!- The basic principles of behavior management work on ANYONE. That means they will work on your child, your husband or wife, your boss, and even your child's teacher. Let the teacher know they are doing a good job. Comment on new items or objects placed in the classroom. If you know the teacher just returned from a vacation, inquire about their trip. When the teacher takes the time to speak to you before or after school, thank them for doing so. Everyone likes to hear feedback that they are performing their job well. Be mindful of how many times you contact the teacher with a compliant, or a negative statement, and how many times you complimented, or gave positive feedback to the teacher. Start any school conference or meeting by thanking the staff present for their hard work and dedication (even if you have yet to see any hard work!). Praise and compliments are free, so give them away. Be Aware that You are an Advocate- Maybe you are a parent who doesn't have a Behavior Analyst working with your child. Maybe the school doesn't have someone on staff who is adequately trained in Autism, or knowledgeable in ABA. What do you do in these situations?? You become your child's advocate first, and parent second. Offer to come into the classroom and show the teacher techniques or strategies. Give concrete examples of behavior techniques to them, and explain why they work. Approach the school and the teachers as the expert on your child (which you are). Educate, and make the teacher aware of ABA. Do not assume your child's teacher is adequately trained to incorporate ABA principles into the classroom. They may need your help to do so in an effective way. I have helped a few parents put together documents, video clips, or short reports before IEP Meetings. A sample report could include: a short video clip of your child working at the table during an ABA session, a list of items they find reinforcing, a current list of active programs, a list of mastered programs, and detailed areas of strengths and weaknesses.